James Mellor, 20, from Derby is taking on one of the most brutal challenges in athletics to raise funds for Myeloma UK. UPDATE: James completed his Ironman challenge in a time of 10 hours, 19 minutes and 33 seconds (placing him 380th out of 2247 finishers). He managed to raise around £3,000 for Myeloma UK and was in the top 3% of JustGiving fundraisers in August. 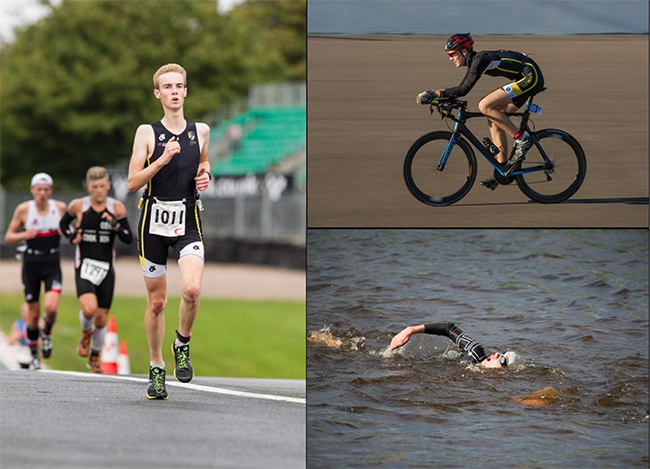 Now a medical student at the University of Sheffield, James is pushing his triathlon experience to the extreme by entering his first Ironman endurance even in Copenhagen this August; a 3.86 km/2.4 mile open water swim, 108.25 km/112 mile bike ride followed by a marathon. James said, “Last summer my Dad broke his arm in a tube train door, which through many scans and blood tests lead to him being diagnosed with myeloma, which was why it broke so easily. “The first stages of Dad’s treatment were extremely successful and so in January he received a stem cell transplant of his own stem cells and after a period of strong chemotherapy, is now in remission. I have been amazed by the support he has received and how personalised and well planned his treatment has been. This is only possible due to the incredible research which can hopefully further improve prognosis of patients with myeloma in the future. You can find out more about James’ epic challenge and keep up-to-date on his JustGiving Page. If you want to take on your own challenge for Myeloma UK, contact our Fundraising Team on 0131 557 3332 or fundraising@myeloma.org.uk, to find out how we can help you raise money to make myeloma history.